crisis management Archives | Rozdeba Brand & Co.
Can You Put Your Trust In Brands? Is brand trust in a crisis? Brand trust is earned through consistently delivering on the brand’s promise. Brand trust is the only way you can build loyal brand advocates. But the global trend is working in the opposite direction. Young & Rubicam BrandAsset Valuator reveals that consumers trust in renowned brands continues to slide. In 1997, consumers indicated that they had a high level of confidence in 52% of brands. By 2008 that percentage dropped to 22%. The Edelman Trust Barometer confirms the same trend with their annual survey. In 2015, for the first time since the end of the Great Recession of 2007-08, their survey signaled a major decline in trust with 16 of 27 countries dropping below their acceptable 50% level into the “distruster” category. For example, Canada went from a 62% trust level in 2014 to 47% in 2015. A drop of 15%! What’s going on? In the climate of austerity are we starting to see brands cutting corners or blatantly deceiving consumers to protect their bottom line. Since 2007-08 the world economy hasn’t been the same and the recent financial instability in China will continue put pressure on brands to perform. Professor Klaus Schwab, founder and chairman of the World Economic Forum, explains that “There are four prerequisites of the company’s survival; profitability, growth, risk protection and earning public trust.” While we may expect people sometimes to lie, like athletes, actors and most certainly politicians, we don’t expect brands to lie. Why would global companies risk their brand equity by outright lying to their customers? Volkswagen VW, the world’s largest carmaker (past tense) did exactly that when they lied about their emissions tests through cheating software. Why would a mega brand risk its reputation? Profits seems to be the ultimate goal. Jointly Germany car manufactures, actively promoted to Americans that diesel was the future to meet tougher US emission standards. The only way VW was able to compete and live up to the promise was to lie. The arrogance that they thought they wouldn’t get caught is scary, especially since they publicly promised to be the ‘greenest’ car producer in the world by 2018. The lie allowed VW to claim their diesel engine were superior – selling over 12.6 million of them. The fact that buyers used to pay a $2,700 premium over gasoline engines for VW diesels meant an additional $34 billion in VW’s bank account. But the real problem was the fact that their engines emitted nitrogen oxide pollutants up to 40 times above US standards. This environmental damage can’t be fixed. In a CNN Money report, the financial service holding company Credit Suisse estimated the cost of the VW diesel emissions scandal could exceed $86 billion. About the same GDP value as a country like Ecuador. Volkswagen is facing a very big trust-tax notwithstanding that they are trying to attract customers today through deep discounts. 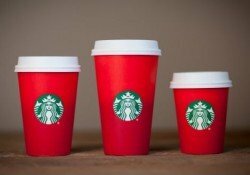 Recently, another scandal was released by CBC Marketplace revealing that Starbucks and Tim Hortons are misleading their customers. They claim the paper cups collected in their in-store recycling bins are being recycled but are actually going into landfills. It seems these paper cups have a plastic lining that requires an additional step in the recycling process, which costs money. So why would two big brands like Starbucks and Tim Hortons mislead their customers to think that they are being environmentally responsible? What’s the impact of a paper cup? CBC estimates that Canadians use over 1.5 billion disposable coffee cups in a year which is equivalent to more than half a million trees. The environmental impact is significant. I don’t know what the cost of recycling a coffee cup is but it is obviously worth more than the truth. But we will have to see if consumers make them pay. There is an apparent financial gain that can be significant over time. But who analyzes the brand risk? In an Intangible Asset Market study by Ocean Tomo, they state that in 1975 intangible assets were just 17% of the market value of the S&P 500. Today, intangible assets are 84% of the market value of the S&P 500. What are intangible assets you ask? They are intellectual property (patents, trademarks etc. ), goodwill and brand equity. Most of which is built on a foundation of trust. Every day we are seeing new brands entering into the marketplace. The explosion of new brands, globalization and intense competition are major problems for brands. According to a Datamonitor report, 58,375 new products were introduced worldwide in 2006, more than double the number from 2002. The reality is consumers have more choices and more choices means more competition for brands, which means more pressure on profits. Moral: Brand equity is important and should be cultivated and protected. Brand reputation and image are now firmly in the hands of the consumer, as they control the conversation via digital channels. Nielsen’s Global Trust in Advertising Survey of more than 28,000 Internet respondents in 56 countries said that 92% of consumers around the world trust recommendations from friends and family above all other forms of advertising; an increase of 18% since 2007. Moral: Brands must integrate into digital channels to communicate with customers on their terms. The Edelman Trust Barometer says that the major factor in depressing trust is the rapid implementation of new technology that’s changing everyday life. Of people surveyed 54% were very cynical about new technology, stating “business growth or greed/money are the real impetuses behind innovation.” The problem with most innovations introduced to the market is little work is done to explain to the consumers why this innovation is a good thing in the first place. Genetically Modified Organisms (GMO) are a good example. GM seeds were introduced to farmers to help them increase yields but for the average consumer what did this mean? What was good about inserting a gene from one plant to another and how would consumers benefit from this. Then add, misinformed activists and their scare tactics to label these ‘Frankenfood’ and consumers start getting concerned. Moral: Brands must speak down-to-earth consumer language. The moral of this story is brand’s need a strong governance model to uphold the brand’s core values. This foundation ensure all business decisions are based on those values. Building strong and lasting brands takes time and resources. Lying is one of the quickest ways to ruin a beautiful brand relationship. The real shame in all of this is there are many brands built and operated by honest people that pride themselves on being authentic and truthful. Every brand should be very afraid. Power to the people, as the saying goes. Thanks to the internet consumers have a say in everything a brand does, good and bad. Today, we are seeing more and more people crowding together as a force to be reckoned with – a force that can turn into a destructive attack and can cause a brand serious damage. 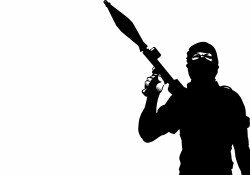 These attackers, or dare I say terrorists, can be competitors, disgruntled employees, unhappy customers, extortionists, activists or others more sinister who want to cause a brand harm or even ultimate assassination. Last October on CBS 60 Minutes FBI director James Cormey was recorded saying “there are two kinds of big companies in the United States … those who’ve been hacked by the Chinese and those who don’t know they’ve been hacked by the Chinese.” Then there are those who have been hacked by North Korea. Hacking big brands are a big problem. Robert Herjavec, founder of global IT security firm The Herjavec Group and star on the TV show Shark Tank says “The higher profile your brand, the more value it carries and the bigger a target it is.” No surprise major American brands have been significantly effective. A very memorable attack was just prior to Christmas in 2013 with over 70 million credit card customers’ files hacked at Target. The Wall Street Journal estimates the Target hack cost over $350 million including replacement cards and IT expenses. But the fall-out went beyond direct costs to the departure of the company’s Chief Information Officer and the Chief Executive Officer. The actual cost of customer’s losing confidence in Target was never part of the equation. In a study done by RedSeal, a cybersecurity company in USA, found that almost 80% of 350 C-level executives admit that a cyberattack can inflict “serious impacts to business profitability and growth,” and bring about “serious brand damage.” If you asked Sony Pictures senior executives they would whole-heartily agree. This last Christmas season Sony Pictures experienced one of the biggest online data heists to date. Earlier in 2015 Sony Pictures downplayed the massive hack as only a 15 million dollar inconvenience. Their revenues were down by 11.7% for that quarter partly due to not fully releasing their controversial movie The Interview, thanks to the threats from Kim Jong-un. How about the hacking group Rex Mundi who demanded over $40,000 from the fast-food chain, Domino’s Pizza for ransom of 600,000 Belgian and French customers’ personal data records including their favourite pizza toppings. As the story goes, Domino’s refused to comply and the hackers never released the information. Maybe they paid them off with free pizzas for a year. A 2014 study by BrightLocal found that 88% of consumers trust online reviews as much as personal recommendations (vs. 79% in 2013). The popular review site Yelp.com contains over 70 million reviews of restaurants, barbers, mechanics, and other services. Roughly 16% of reviews are removed by Yelp because they are deemed fake both positive and negative. Vince Sollitto, VP of Global Corporate Communications at Yelp says their “job is to find and filter out fake reviews. At the same time we let our audience know that this system isn’t perfect. Some legitimate content might get filtered and some illegitimate content might sneak through.” Over two years, Yelp caught 400 companies trying to game the system – sounds like they weren’t very good gamers. The New York Times reported on a case of a business hiring workers on Mechanical Turk (an Amazon-owned crowdsourcing marketplace) to post fake 5-star Yelp reviews on their behalf for as little as 25 cents per review. I’m sure 1-star reviews are even cheaper, which would be a deal to take down an adversary. The scary part is there are so many places you can post malicious, false rants or claims beyond the traditional review sites that are monitored. There are a number of gripe sites people can share their hateful brand story. If you have a gripe, there is a website. According to research by Ponemon Institute, 43% of companies reported security breaches in 2014 which is up from 33% in 2013. So what can you do? Mailguard experts in online security says you need a “Brand Guardian” to oversee monitoring and reporting system to scan and monitor your website for hacked pages, potential malware and security risks such as phishing links. Research firm Gartner warn that one in seven posted reviews are likely false. How do you respond to these reviews? First you have to keep your cool. Fighting fire with fire doesn’t work here. Check out the website policies and contact the website support team with your concerns. If they can’t help, then respond directly to the review in a professional and civil manner and if possible offer a solution. Jeff Hancock, professor at Cornell University and expert in “Faking It” gives some excellent tips on how to spot a fake review. To further heighten the brand negativity, the assailants, armed with creativity and talent, will associate the attacked brand with something or someone consumers would consider offensive (examples below). The sad thing is these images don’t have an expiry date and will pop-up whenever and forever on the internet. 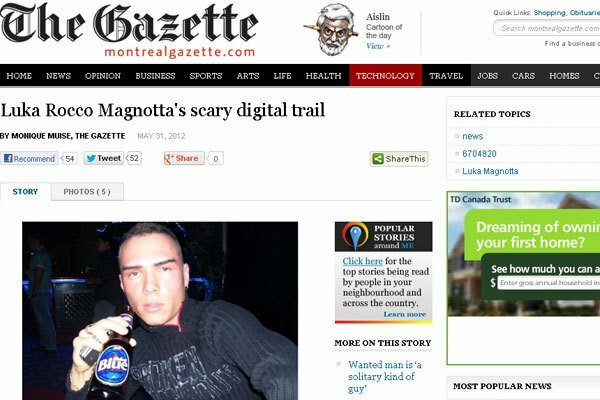 During a recent highly publicized gruesome murder case, the killer Luka Magnotta was found on the Montreal Gazette’s website holding a bottle of Labatt Blue beer. Labatt Breweries of Canada threaten to take legal action against the paper if they didn’t remove the photo. This ignited Twitter and Facebook followers to engage in the conversation creating more negative media for Labatt. They used the hashtag #newlabattcampaign to post fake negative advertising for the beer. Not a successful outcome for Labatt. From all corners of the internet, conversations about brands are taking place both positive and negative, whether the brand participates or not. The real trick is understanding when the brand should and shouldn’t engage in the conversation. But, what’s really important is that your brand be visible online when people want to hear your side of the story. On Mike Ewing’s blog, he quotes a study that says 90% of people believe brand recommendations from friends. That is a strong endorsement for word-of-mouth. Social media has become the future version of public flocking, stoning, lynching and the people’s court – all in one. But, it is also the best word-of-mouth when people are raving about their brand experiences. It’s a two edge sword. People can lose their jobs in minutes or find themselves on the nightly news after being captured on video doing something regrettable that can never be erased. Most brands are represented by people – fallible people; therefore, brands quickly get implicated when an employee is captured at work or off work doing something unsightly for some. There is no longer a line between church and state. The righteous understand that they have more power pressuring the employer to get the appropriate action they are looking for. The scope, reach and speed which harmful content can move around the internet is truly alarming. Six years ago, Domino’s Pizza saw this first hand as two employees posted a prank video of unsanitary and disgusting food preparation practices in one of their stores. I am sure you saw it on Facebook. Within a few days (today it would be hours) there was over a million views on YouTube. Here is a news report of the event. Domino’s President, Patrick Doyle, responded with his own YouTube video to apologize and reassure customers’. He said there was nothing more important and sacred to Domino’s than its customer’s trust. That being said, the damage was done. A study done by HCD Research found that 65% of respondents who would previously visit or order Domino’s Pizza were less likely to do so after viewing the offensive video. NGO’s also understand the power of social media to not only get their message out, but to activate people and supporters. They have two objectives: to raise money and to stop brands from doing something they deem bad through the power of amplification (i.e. using concerned citizens who are trying to do right). In some cases, they will take a fact about your brand grossly out of context or exaggerate it, making an ordinary shortcoming seem horrifying. In most cases it’s about terrifying the public to take action. Mark Twain said “Never let the truth stand in the way of a good story”. The first is an attack on the Nestlé’s Kit Kat brand to stop them from using palm oil from Indonesia where many animals were threatened by unsustainable forest clearing for palm oil. Nestlé now has a goal of using only palm oil certified as sustainable. The next attack was on Shell Oil and the toymaker, Lego. Since the 1960’s, Shell promoted a Shell-branded Lego sets at gas stations. Greenpeace protested Shell’s plans for Arctic oil exploration via the Lego’s partnership. The campaign was successfully in ending the partnership between Lego and Shell. I believe Shell is still perusing its plans in the Arctic but are more dependent on oil prices at this point. And finally, the attack on British Petroleum after their major oil spill in the Gulf of Mexico. Greenpeace launched a “Rebrand the BP Logo” contest. 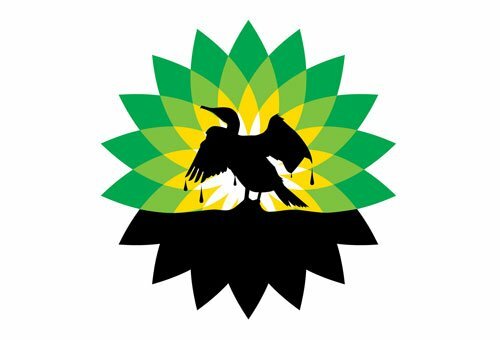 They asked supporters to “…create a logo for BP which shows that the company is…up to their necks in tar sands and deepwater drilling.” Here was the winning design by Laurent Hunziker. Have an action plan ready for scenarios like the ones described in this article. If anything you do or offer has the potential to be used against you, be prepared to address it. Have experts available at a given moment to provide support and advice. Have a digital and social presence with consistent messages that can be easily found. Continue to build brand trust online like you do in real-life. Understand who is saying what and who are the influencers. Setup Google Alerts to notify when you brand is mentioned somewhere on the internet. Google your brand name once a week or more. Understand your environments (industry, political, geography) to catch trends that put you at risk (i.e. consumer opinion, fads and referendums). If you find your brand under attack, take appropriate action. I say ‘appropriate’ because sometimes no action is the right action. Be honest and sincere, even when the attack isn’t. Remember you are protecting your relationship with your customers – respond to them and not the attacker. Seek expert help when necessary. With the help of social media and a couple of million friends, consumers and attackers have a lot of power, more than any brand will have, because people will believe people first. According to Nielsen, 92% of consumers believe recommendations from friends and family over all forms of advertising. Generally, most consumers can distinguish between facts, hate and fiction. The problem today is more and more hate and fiction is being packaged into well-crafted emotional stories that become viral sensations before any truth hits the web, which is too late. The collective world has made their verdict and has moved on to the next terrorist attack, while the brand tries to regain trust and fix the damage. For small businesses and individuals, the damage may not be repairable. A few brutal reviews on Yelp may destroy a small business, but may not have the same effect on a BP or Monsanto (two of the most hated brands based on market research firm Harris Poll). Both companies have received their fair-share of NGO’s attacks, Facebook boycotts and bans, Twitter hashtags like #monsantoevil and #boycottBP, YouTube videos, protests and marchers, and Halloween costumes. But, they are both still in business and doing well. As a matter of fact, Monsanto’s 2014 sales were up 7% over 2013 for a total of $15 billion, while BP Group’s 2014 sales dropped 11% compared to 2014 for a total of just $214 billion. Consumers have a short memory and if you respond quickly and fix the problem (if one exists), they will forgive you and come back. 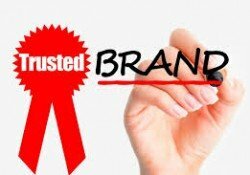 More importantly, if you brand is strong, your loyal customers will come to your rescue and defend you. I can’t emphasize the importance of being prepared for all possible situations. If you don’t have all the right answers now, at least make sure you have a clear crisis escalation organization chart of who needs to be involved when the attack occurs. Time is the biggest challenge when the verdict is immediate. Be alert and ready for any possible brand terrorist attack.